Recently I watched a documentary called 'Friends of Kim', it was about a group of foreigners of a pro North Korean organisation called the 'Korean Friendship Association' who visited North Korea as a tour group. All cancelled their memberships after the visit. After seeing for themselves the living nightmare of this failed state and the oppressive nature of it's government and officials. I had read before of the links between the African National Congress (ANC) and North Korea during Apartheid and wanted to see whether they still had friendly relations with the regime. “ANC Youth League Unapologetically Supports North Korea”. A delegation of the ANC Youth League visited North Korea in September last year in preparation for the World Festival of Youth to be held in South Africa. The spokesperson of the ANCYL in his own words stated “we support North Korea unapologetically” and confirmed that the meeting took place. His speech and several quotes from the spokesperson were recorded and published by the North Korean state-owned news agency KCNA including him stating that their cause “ is just and fair”. To be honest, I wasn't really too surprised, as the beliefs of this totalitarian Communist state are very much similar to those currently voiced by ANCYL. They openly call for the banks and mines to be be seized by the state and for white-owned land to be taken without renumeration and 're-distributed'. Combined with the fact that they openly oppose capitalism and a free-market system and are Marxist-Leninist, and like their parent organisation they believe in a centralised state of “total hegemony in all sectors of society”. 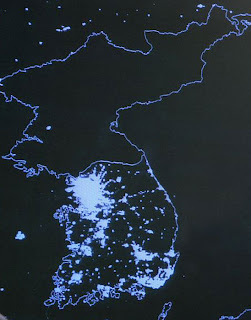 North Korea is a failed state. A country that has fallen out of the developed world, that once had a functioning infrastructure, albeit one that was heavily subsidised and propped-up by the Soviet Union. But some of the people still remember a time when things still worked. It is a totalitarian dictatorship that keeps hundreds of thousands of its people in concentration camps, even testing biological weapons on entire families of 'traitors' at a time, locking them up in glass tubes and using deadly gas on them to see the reactions, and to see how they die. This is a place where there is no such thing as freedom of speech, belief or of association, where the people are kept in constant terror by the state police and army. Just criticising the regime could get you and your entire family sentenced to the 'fifth degree', meaning your cousins, second-cousins and anyone even remotely related to get the same punishment, namely a death camp or a labour camp if they're lucky. Where they'd be tortured, starved and literally worked to death. The cities are utterly run-down, littered with gaping abandoned factories that have long been stripped for parts and scrap metal. People are so hungry so they even resort to eating grass, as much of their farming has collapsed due to disastrous government policies, creating a barren wasteland of useless soil unable to grow anything. This had lead to a landscape of mountains stripped bare of all trees and any sign of living life in order for people to survive. In this country, people consider pine-cones and bark as food. There is barely any system of functioning electricity in the country with the exception of their capital Pyongyang, yet even this city is hit regularly with power-failures. While water in the capital is often only running at certain hours. And their transport network is likewise barely functioning. Even if one gets permission to travel, the trains still regularly break-down while even going at a slow pace and their buses are literally antiques. Much of the city outside the capital has regressed to the levels of living of peasants pre-World War II. Life is a constant struggle of inactivity to save energy and burn as little calories as possible and a relentless search for food. Everything on their mind is about the next meal, how to catch the next bugs, where to find another rat, or who has some food stashed away to steal? One could understand if the locals support their regime. They've been brainwashed from an early age, have weekly 'self-criticism' meetings where they have to openly admit their failings to their family, friends and colleagues, and make sure to show enough conviction and grief with a sufficient amount of wailing and despair to satisfy the officials. They are conditioned to a life of non-stop never-ending terror. They're sleep-deprived and are forced alongside their long work shifts to 'volunteer' for state construction projects overseen by armed guards while vehicles blare a constant stream of propaganda and music from loudspeakers. There is barely any machinery or anything even as basic as electric drills so the labour is utterly back-breaking and at Victorian-era levels in terms of technology. While some are forced to work in the mines in slave-like conditions, virtually in darkness and exposed to chemicals which will usually kill them over time if they haven't already died due to the harsh conditions. Their shift can only end if they've reached their quota and nce again there's no electricity, they're using picks and have to push, drag or often just carry the rocks in their arms without any protective clothing. In the their houses, if they're lucky enough to get electricity, they're allowed to have a single 40 watt light bulb for the entire house. And their TV (if they're privileged enough) is mostly a never-ending loop of military parades, while shows deal with issues such as conforming to Socialist hairstyles while viewers follow agents confronting men in the streets whose hair is not in millimetrical conformity with the specifications outlined by their Dear Leader Kim Jong IL. And where state television teaches people how to cook bark and grass, leading to their own death if they follow this advice. This is a country where soldiers die in their barracks from starvation. Where they roam around the countryside in armed groups and take food from peasants by force in order to survive since they barely get enough rations to live on. And virtually all fuel available in the country is allocated to the military. No-one owns a car except the small elite of the Workers Party. This is a place where in order to survive one must learn from an early age to break the rules and steal, or die from starvation, since if one is lucky enough to get their rations it's still not enough to live on. It is a country of midgets, where people are considerably shorter than those in the in the South, despite being of the same race. Their growth has been stunted due to malnutrition and they're about a foot a shorter than their countrymen in the South. And where as a result of such malnutrition women have been known to only have their first period at 21, while late teens is common. North Korea is a place where state television has to blur the visuals if they show footage of riots in South Korea or of people outside their borders so that the population cannot see how well they're dressed. Since most North Koreans only have a single pair of clothes, mostly ragged and threadbare. Those 'fortunate' enough to live in the showcase capital Pyongyang are the political elite and even their supposedly good clothing such as a suite, is very poor in quality and made of a mass-produced cheap material unique to North Korea. The fact that the ANCYL support this regime and it's system of government, even after seeing it themselves first-hand, says much about them. Not to mention what it says about their parent organisation, the ANC. Who according to the Youth League use them to publicly test some of their more controversial policies and see the public reaction to them. Before the fall of the Soviet Union, the ANC was talking about creating “East Germany in Africa”, their socialist vision of a South Africa under their total control and with Soviet backing. Most had been trained in the Eastern Bloc countries and the Soviet Union and have still not abandoned the Marxist-Leninist ideology that was ingrained in their minds. As a result they still largely view the world from an archaic Cold War perspective where capitalism and the West are the enemies. Today they still call each other 'comrade' and use Marxist and Communist terminology in their manifestos and openly on the publications on their website. They talk of the 'National Democratic Revolution' which is the second-stage after taking control of the country, the third-phase is to implement full-blown Socialism and where the state has total control in all sectors. If one reads their literature it's right there, it's not a hidden agenda, most local whites don't understand the terms so think nothing of it, but to their followers, they know what the 'National Democratic Revolution' is referring to. 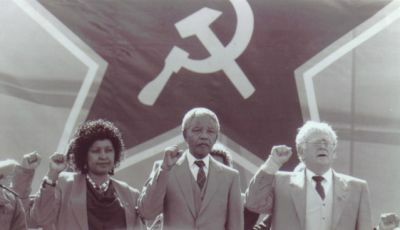 Many of the ANC have dual memberships with the SA Communist Party, and prior to coming into the power the majority of them did. The ANC are allies with North Korea, they are also allies with Cuba and Hugo Chavez's Venezuela. And before Saddam Hussein was ousted they used to give the visiting Ministers from his regime red-carpet welcomes to SA. And they still support Libya, arguing against the bombing of this regime and of Gaddafi's arrest if he flees and offering him asylum. Once again, Gaddafi and his ministers also used to receive official red-carpet welcomes to South Africa. They're also on friendly terms with the terrorist group Hamas and have voiced their support and have also declared solidarity with Iran. 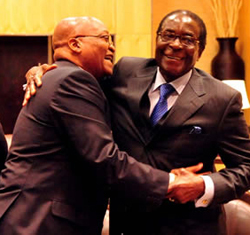 The ANC are friends with every single enemy of the West. 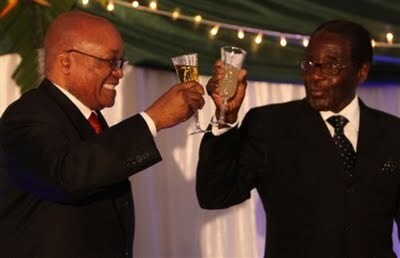 Then there's Mugabe, who doesn't only get the red-carpet welcoming but is also usually embraced and holding hands with the previous and the current President as a sign of solidarity. They support him and his regime because the notion of a 'liberation movement' being ousted from power by the public is not a pleasant reality for them and not one they want to dwell on too much. The ousting of a fellow liberation movement from power would have set a precedent, a dissatisfied public would see it is possible and that there is an alternative. Meaning that the ANC could be next. So by all means possible they could not allow Mugabe's regime to end, even though they were elected out of power by a democratic vote. They gave political support and most important of all large financial support to prop up their regime which would have collapsed if it weren't from the funds given to them by the ANC. There's a saying that says you can usually judge the nature of a person by the company they keep. The ANC and their ANCYL are morally bankrupt. There's not much else one can really say about a government that supports regimes which brutalise it's own populations and are ruled by one-party dictatorships. It would be also interesting to know more about the current relationship bewtween ANCYL/Malema and Hugo Chavez.According to old news reports, ANCYL went on a"study trip"to Venezuela in 2010. The objective of the trip as to find out more about the nationalisation program implemented by Chavez in Venezuela.According to his supporters, it has been a success for the pro poor relief program, accordig to others it plunged the country to a mess. If you look up Youtube, you will come up with great documentaries which show various similar aspects of the"Bolivarian Revolution"to what Malema would like to do in SA.